GardenPRO Hand Trowel. 6" blade with traditional wooden handle. Ideal for border, tubs..
GardenPRO Hand Fork. 6" blade with traditional style wooden handle. Ideal for weeding ..
GardenPRO Garden Spade. Solid forged carbon steel head and socket for strength. Epoxy coated..
GardenPRO Garden Fork. Solid forged carbon steel head and socket for strength. Epoxy coated ..
GardenPRO Manure Fork. Solid forged carbon steel head and strapped socket for extra strength. ..
GardenPRO Edging Iron. Solid forged carbon steel head and socket for strength. Epoxy coated..
GardenPRO Dutch Hoe. Epoxy coated finish, which protects it against rust, scratches, humidity ..
Lightweight yet hardwearing manure fork The fully forged head has no weak points and will withs..
GardenPRO Turfing Iron. Solid forged carbon steel head and socket for strength. Epoxy coate..
GardenPRO Garden Rake. The shape of the 12 teeth means the head will glide effortlessly, witho..
GardenPRO Lawn Rake. 20 heat treated tynes are designed for scarifying lawns, removing unwante..
GardenPro Garden Leaf Rake. A wide headed rake with 21 plastic tines mounted on a rigid plasti..
GardenPRO Wooden Hay Rake. Based on the traditional haywainers pattern, with a wide head and l.. Cast from high grade aluminium, light in weight yet strong by design. Perfect for raking hay, c.. Single Edge Dunse Slasher. Solid forged 10" blade with a 36" hickory handle. This slasher i.. Forged and rolled from a single piece of high quality steel. Suitable for a wide variety of app.. 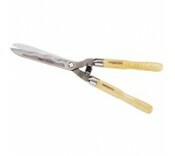 Bypass action loppers are generally used for living wood. Pressed and Teflon Coated from high q..
Versatile saw for pruning branches, trees, fencing and all timbers The pistol improves control ..
Drop forged from high quality heat treated steel with tubular aluminium handles Ideal for trimm.. Pressed and Teflon® Coated from high quality heat treated steel with tubular aluminium handles ..